Some riders want to tame the trail. But for those who want to dominate it, ZR® Limited adds an easily adjustable suspension calibration to our legendary ZR. ZR 6000 Limited: The class-leading power of our 6000-Series C-TEC2™ engine with your choice of iACT™ Adjustable On-the-Fly Suspension or FOX® QS3 shocks. iACT - Adjustable On-The-Fly Electronic Suspension: Switch between soft, medium and firm suspension at the push of a button, with handlebar-mounted controls that automatically and immediately adjust your suspension FOX ZERO iQS gas shocks. FOX® ZERO iQS Shocks: Easy to adjust, and built for any terrain and riding style. Our premium FOX ZERO iQS shocks are available in 1.5- or 2.0-inch diameters. Engine Lineup: Choose between the 6000 or 8000 C-TEC2™ engine families to power your ZR Limited — both designed and Built by Arctic Cat® in St. Cloud, Minn.
ARS™ II Front Suspension: Designed to deliver the increased cornering bite and ground clearance you need for confidence-inspiring handling. 137" SLIDE-ACTION Rear Suspension™: Get the most out of a coupled suspension, with a unique, industry-exclusive design that keeps the front arm engaged while the rear arm compresses. Coolant System Capacity: 6 qt. Rear Suspension: SLIDE-ACTION with 3 Wheel Rear Axle Assembly, Coupling Blocks, Torque-Sensing Link Rear Arm and Adjustable Torsion Springs. Interactive Arctic Cat Technology Suspension available on select models. Overall Chassis Length: 125 in. Estimated Dry Weight: 512 lbs. Ski Type/Width: Trail - 6 in. SLIDE-ACTION with 3 Wheel Rear Axle Assembly, Coupling Blocks, Torque-Sensing Link Rear Arm and Adjustable Torsion Springs. 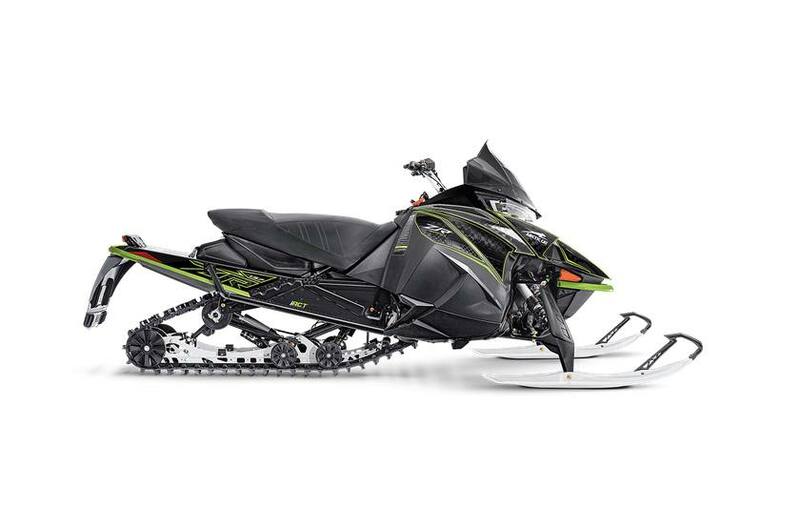 Interactive Arctic Cat Technology Suspension available on select models. 15 in. x 137 in. x 1.25 in.